If snowboarding is a concept you’ve relegated to the exclusive domain of Winter X Games and hip teenagers, think again. Last season, adults age 25–54 accounted for 46 percent of all snowboarders. Lately, it’s also been easier to learn than ever before. Burton, the company that invented the modern snowboard, launched a Learn To Ride (LTR) program. From the teaching style to the equipment, it’s designed to get a first-timer comfortably linking turns by the end of the first day. The Burton LTR program is not the only way to learn how to snowboard of course, but it can help everyone from longtime skiers looking to try something new to parents hoping to embrace the kids’ winter sport of choice to genuine winter snow sports novices considering snowboarding as an entry point into the fun. Especially since Long Island is within a short drive from a host of stellar mountains that seriously cater to snowboarders. Plus, since January is national Learn to Ski and Snowboard Month, special promotions and events will likely add to the fun. Many will remember the days when this mountain was known as Vernon Valley/Great Gorge. 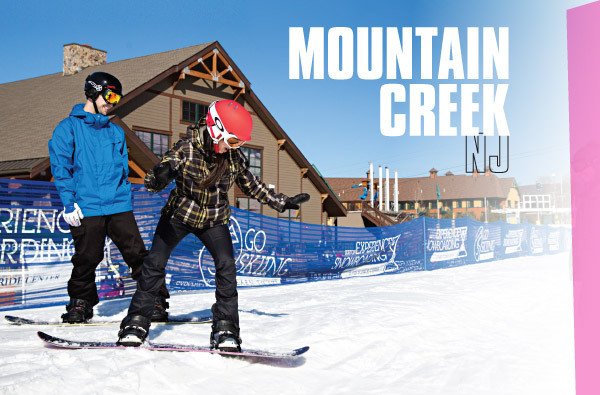 Back in 1998 Intrawest renamed it Mountain Creek and gave it a top-to-bottom overhaul catering specifically to snowboarders with an air of New York City style for the downstate crowd. Located just 47 miles from the George Washington Bridge, it offers 1,000’ of vertical, plus 100 percent snowmaking coverage and 100 percent of the mountain is open for night skiing and riding. Mountain Creek is divided into four peaks, but newbie snowboarders will want to focus on the base of Vernon Peak, where there is plenty of beginner terrain. The runs are wide, there are ample slow zones—even the top-to-bottom Horizon run is welcoming—and the mountain’s snowboarding progression center is a friendly pit stop. Once criticized for long lift lines, a number of high-speed lifts (including an eight-person gondola on Vernon Peak), have made that largely a thing of the past. 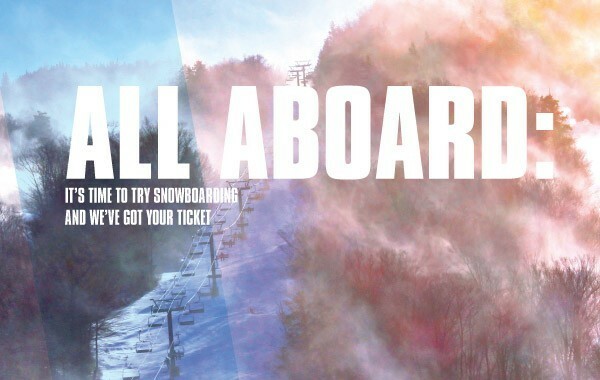 Sign up for one of the Burton Experience Snowboarding packages. The 3x Guaranteed Experience is the best value—just $130 for three limited-access lift tickets, three rentals and three 1½ hour-long lessons. The mountain offers an inclusive resort experience. If slopeside lodging is desired, the condos at The Appalachian are the way to go. But for a more posh stay, look to the luxurious Grand Cascades Lodge. 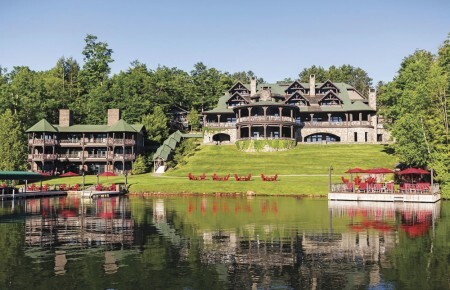 Its large wooden beams, stonework and nature-inspired color palette evoke the architectural style of grand Adirondack lodges. Plus, on-site Reflections Spa (try the Active Life massage) is a great way to rejuvenate sore snowboarding muscles you didn’t even know you had. Diversity abounds, but on-mountain Hawk’s Nest and Biergarten restaurants are good options for both upscale and casual venues (respectively) that serve wurst (brat, knock and weiss), sauerkraut, German potato salad and pretzels, not to mention half- and whole-liter steins of German and domestic brews. At Schuss—despite its German name—find Italian fare, including antipasto, wood-fired pizzas and a dessert menu that includes zeppoli, cannoli and tiramisu. Just down Route 94 is Milano Family Restaurant, a popular local joint with all the usual Italian suspects. This one’s BYOB, plan accordingly. Hunter represents New York’s Catskill Mountains at their finest: 1,600’ of vertical drop amidst the wilderness of one of the state’s great forest preserves. From the summit lodge the views northeast to the rugged Blackhead Range are simply stunning. 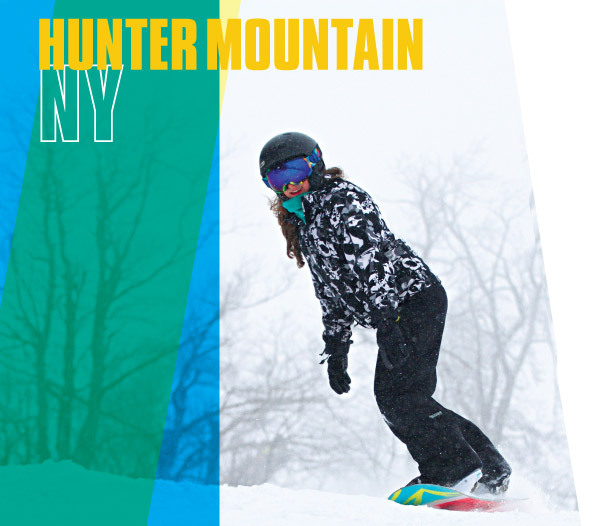 Hunter is divided into three areas—Hunter Mountain, Hunter West and Hunter One—but focus on beginner-friendly Hunter One, where nine out of 16 runs are greens. Overall, a whopping 30 percent of the resort is beginner terrain. There’s no being stuck on a small handful of runs here. By far the best learn-to-snowboard deal at Hunter is the Beginner Try-Pak. A scant $109 includes three non-holiday, lower-mountain lift tickets, group lessons and equipment rentals from the mountain’s Burton Learn To Ride arsenal. Or, for $35, sign up for a Progression Session, where lessons are matched to a rider’s skill level: First Timer, Control (discovering green terrain) and Linking Turns, for example. For the classic slopeside stay, the Kaatskill Mountain Club and Pinnacle and Liftside/Trailside condos are the way to go. They’re close enough to the action you could throw a snowball from your window and hit the high-speed, six-passenger Kaatskill Flyer chair (not that we’re actually suggesting that). For a decidedly quirkier stay—one written up by the likes of National Geographic Traveler’s Best Hotels in North America—head for The Roxbury a short drive west. Its themed rooms evoke famous tv shows and movies of a bygone era. Fred’s Lair (Flintstones, anyone? ), The Partridge Nest and The Wizard’s Emeralds (yes, Oz), are just a few. At the mountain, Van Winkle’s is local chef Tim Lang’s restaurant for inventive fare. For the casual “it” joint, hit up Jerry’s Deli. It’s got plenty of made-to-order sandwiches, but the place is best known for its brisket, served on fresh-baked Jewish rye bread. Cosmic Charlie’s on Main Street in Hunter has standard pub fare with live (and eclectic) music from local rock bands, making it a great après-ski spot where out-of-towners and locals mingle. In nearby Tannersville, head to Last Chance, a local comfort food institution for more than 40 years, with a list of more than 300 beers and 100 cheeses to boot. True to its name, it’s a last opportunity to grab some grub before hitting the Thruway for the ride home. 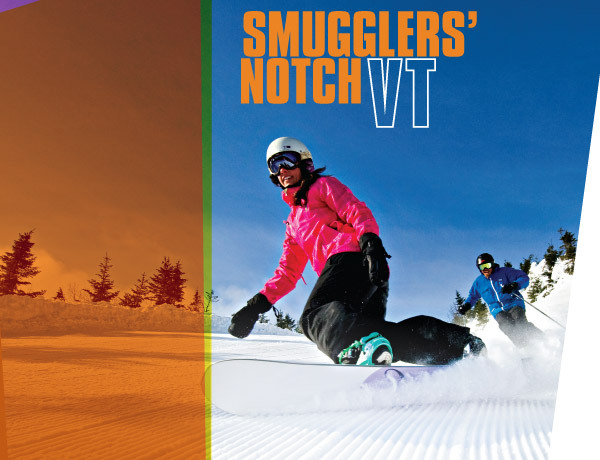 Over 2,600’ of vertical drop from the ridgetops of the Green Mountains to the farm country of the Champlain Valley below make Smuggs a special spot. It captures the moisture blowing off Lake Champlain to the west and transforms it into a snowy winter wonderland. More than 300” of natural snow has fallen in each of the last five years (supplemented by ample snowmaking). Add to that the drama of the Madonna Mountain summit, one of the few genuine 360-degree views of any East Coast ski resort. The view across the rugged notch to Mt. Mansfield, Vermont’s highest peak, is simply spectacular. But focus on Morse Mountain, where the terrain is mostly beginner friendly (resort-wide, one out of every five trails is a green, but at Morse, that ratio’s more like four out of five). Smuggs offers what it calls Snow Sports University: A number of Burton LTR programs specifically for adults. Morse’s base area is also home to Boarding Night School, typically run from 4:30 to 7:00pm three nights per week. For $49 per person/session, students enjoy Burton LTR equipment and 1½ hours of a group lesson followed by one hour to practice individually while instructors roam nearby to help. If you prefer to spend the day skiing or snowtubing but still want to try snowboarding, it’s a great way to fit it into the day. Just be sure to sign up by the 3:30pm same-day deadline to secure a spot, or go for a private lesson (pre-register during holidays and busy weekends before instructors are fully booked). Regardless, start out on Sir Henry’s Hill, a five-acre slope with a gentle grade that’s perfect for learning. Sterling Ridge Resort in nearby Jeffersonville is composed of rustic yet comfortable log cabins with sweeping views of the Green Mountain’s highest peaks. The quaint town is classic New England—don’t miss the Grist Mill covered bridge just off Route 108. For those committed to staying slopeside, five villages of condos are the epicenter of on-mountain lodging. All come with fully equipped kitchens, the usual amenities and most importantly, on-demand shuttle service to other parts of the resort. The newest of the five villages is North Hill Community, where excellent views of the mountain and Smugglers’ Notch Pass are front and center. Start the day right with a visit to Morse Mountain Grille, known for its omelets, oatmeal and cinnamon rolls. Later, warm up with a hearty bowl of chili from Black Bear Tavern, perhaps paired with a Prohibition Ale brewed exclusively for Smuggs by Vermont-based Long Trail Brewery. Hearth & Candle is a great dinner spot featuring locally-farmed ingredients such as Cabot cheddar and McIntosh apples. In nearby Jeffersonville, the unassuming Burger Barn is literally the only place on the planet to find offerings such as the Nutty Goat, a grass-fed, five-ounce burger with goat cheese, bacon, caramelized onions and maple-syrup-crusted walnuts and the Samuel de Champlain, with shaved prosciutto, Camembert, apples and maple mustard. Loon has over 2,000’ of vertical and 20 percent of it is beginner terrain, located just outside Lincoln and Woodstock in the heart of the White Mountains. The likes of Transworld Snowboarding consistently rank the mountain’s terrain parks among the best in the country. But you don’t have to be throwing down a Double McTwist 1260—the maneuver that earned snowboarder Shaun White a gold medal in the last Winter Olympics—to make the most of this mountain. The Mountain Club on Loon is the mountain’s only slopeside accommodation and thanks to a $9 million renovation completed just over one year ago, it delivers. Rooms and suites boast picture windows with million dollar views, the Viaggio spa captures the grace and amenities of its European counterparts and the seafood-inspired menu on-site at Black Diamond Pub (think Atlantic Salmon, haddock, clam chowder, Maine shrimp and lobster) is fit for a king. Off mountain, the I-93/Pemigewasset River corridor is host to plenty of options, from small resorts to hotels to cabins. Among the most charming is Sugar Hill Inn. The likes of Yankee, Every Day with Rachael Ray, SKI and the Boston Globe have raved about the beautifully updated 18th century farmhouse in part because of the cozy fireplaces in nearly every room, views of both Cannon Mountain and Mount Lafayette and the ski-and-stay packages, some of which include complimentary lift tickets at Loon. Loon features no shortage of on-mountain dining options. Among them, don’t miss Camp III Lodge, named for a turn-of-the-20th-century logging camp built nearby. Mid-mountain Camp III is rarely crowded, even during the lunch-hour rush and serves up muffins as well as venison stew and other hearty New England dishes. On warmer late-winter and early-spring days, its south-facing deck is a perfect spot to people watch and soak up some sun. The Common Man in nearby Lincoln hits a similar culinary note, with a “Yankee Favorites” portion of its menu that features dishes like lobster mac and cheese and New England pot roast. Woodstock Inn Station & Brewery in North Woodstock is another local institution that features craft beers inspired by the surrounding mountains. Try the Kanc Country Maple Porter.